The following is a review is for a product called Garden Of Life Dr. Formulated Urinary Tract +. 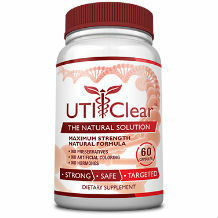 This product claims to support women’s urinary tract and immune health. It claims to deliver digestive and immune support. 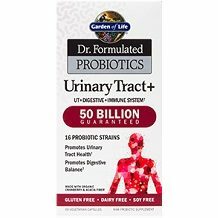 It claims to be a unique formula with probiotics , clinically studied organic whole cranberry and Vitamin D3 to help towards healthy urinary tract function and promote the growth of good bacteria. Other ingredients include:Non-GMO Vegetable Pullulan (capsule). It is gluten, dairy and soy free. The suggested use for this product is for adults to take 2 capsules daily. It may be taken with or without food. The capsules can also be opened. The contents can be taken directly with water or raw juices. There are 60 Vegetarian Capsules. Before using this product you need to consult with your physician, especially if you are pregnant, nursing, anticipate surgery , are on chronic medication or take medication on a regular basis or are otherwise under medical supervision. This product can be purchased online or bought in a store using a store locator. If purchased online, the selling price is $35.96 saving you $8.99. The price is market related although they do not offer any specials on bulk purchases which many other competitors on the market do, saving you a lot of cash at the end of the day. This product guarantees that if you are not 100% satisfied with your purchase, it can be returned within 30 days of purchase. All refunds are applied to the original method of payment. In order to return an item you need to contact their customer service where you will need to give them your name, order number as well as the item number of the product. They stress not to return the product to their corporate address as it will not be refunded. The guarantee is a bit ambiguous as it does not state whether the product will be refunded once opened. This is not very clear nor transparent. This product looks good as it is doctor endorsed and has a ton of good ingredients. The only thing that concerned us was the guarantee that was not very transparent. In order to find out more regarding this you will have to contact the company. We are also aware that no big specials are offered on this specific product when purchased online.